Long time no see! Happy Summer to you! I wanted to share with you my contribution to our holiday eating this past weeekend. We opted to order our meats, Ribs and Chicken from a local BBQ spot in town, but we made our own sides. Well, Mama and I did and Sister provided the meat and a cake lol. I’ve taken to watching the Cooking channel’s, Tia Mowry at Home. On an episode I tuned in to, she and her husband planned a date night at home and they cooked together. Her husband, Cory, shared his Aunt’s Macaroni and Cheese recipe and it looked so good, I decided to give it a whirl in my kitchen. 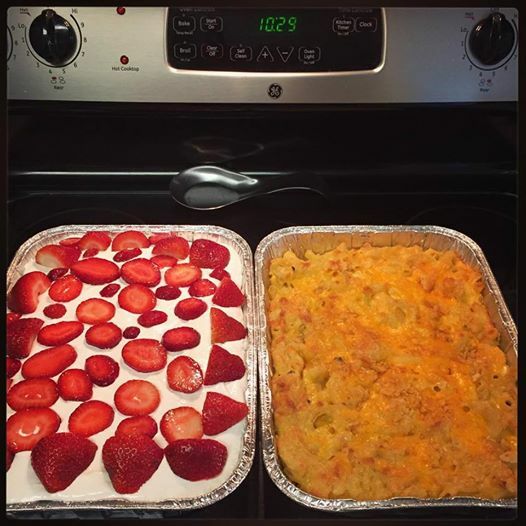 Strawberry Cake & Mac and Cheese! The Mac and Cheese was a hit with my family! I will definitely be making again with a few modifications listed below. The Strawberry Cake has made it’s blog debut before, and I felt it was the perfect dessert for the holiday. And it was loved by all again! I made one cake to take and one for home and also had a small Mac and Cheese for home too! So, it’s safe to say, my contribution to our family holiday eats was all good! Preheat the oven to 375 degrees F. Bring a large pot of water to a boil. Melt the butter in a cast-iron skillet set over low heatit is very important that this step be on low heat! Add the cubed cheddar and melt until creamy, stirring constantly. Stir in the egg, taking care not to let it scramble. While the cheese is melting, add the olive oil and salt to the pot of boiling water. Add the pasta; cook for 10 minutes. Strain and return the pasta to the pot. Add the melted cheese and egg mixture to the cooked pasta, along with the cream of mushroom soup, the evaporated milk and the sour cream; stir, then add half of the cracker crumbs. Mix together until the pasta is well coated and the sauce comes together. Add half of the pasta mixture to a 9-by-13-inch baking dish and top with half of the shredded cheddar. Add the remaining half of the pasta, followed by the remaining shredded cheddar. Sprinkle the remaining cracker crumbs over the top. Bake for 40 minutes. Mods: I only used 3 blocks of Sharp Cheddar and I added 6 oz of Gouda Shredded cheese that I had on hand. The next time I make it, I will melt the cheese in the microwave with a lil milk. That was entirely too much butter! I actually had to pour some off. Also, 40 minutes was too long to cook to me, it dried it out some, so next time I will cut down on the cooking time. What Culinary Delights did you have for the holiday? This entry was posted in Culinary Delights, Holiday, Recipe. Bookmark the permalink. Girl I IMMEDIATELY regretted clicking on this link! haha. My healthy eating is about to go out the window with that mac n cheese recipe! It looks SO good!! Hey Girl! Thank you for reading and commenting! Make this on the weekend and take the leftovers to family or the office lol.